A huge draw to Santa Fe is its incredible art scene. Santa Fe hosts art fairs and festivals throughout the year, and it’s home to over 12 museums and numerous galleries. Santa Fe is the third largest art market in the US after New York and LA, and it has the highest concentration of galleries of any city its size. And most of those galleries are packed within a two-mile radius, making it an incredible destination for art enthusiasts to explore on foot. Here’s a brief overview of Santa Fe’s arts districts, but each one is worth exploring in depth while you’re here. Canyon Road is perhaps Santa Fe’s most famous art district, and understandably so. It’s been a hub for creative types since the early twentieth century, and as home to over 80 galleries, it makes for fun outing that appeals to almost everyone. We love Canyon Road, and it’s the focus of our most popular tour, the Canyon Road Quickie. Last week, we shared five reasons to love Canyon Road, as well as some Canyon Road history, so head over there for more information about this beautiful neighborhood. We’ve also put together a short Canyon Road Cheat Sheet of tips for visiting Canyon Road – covering everything from parking and restrooms to restaurant recommendations – that you can snag for free by signing up for our newsletter at the end of this post. 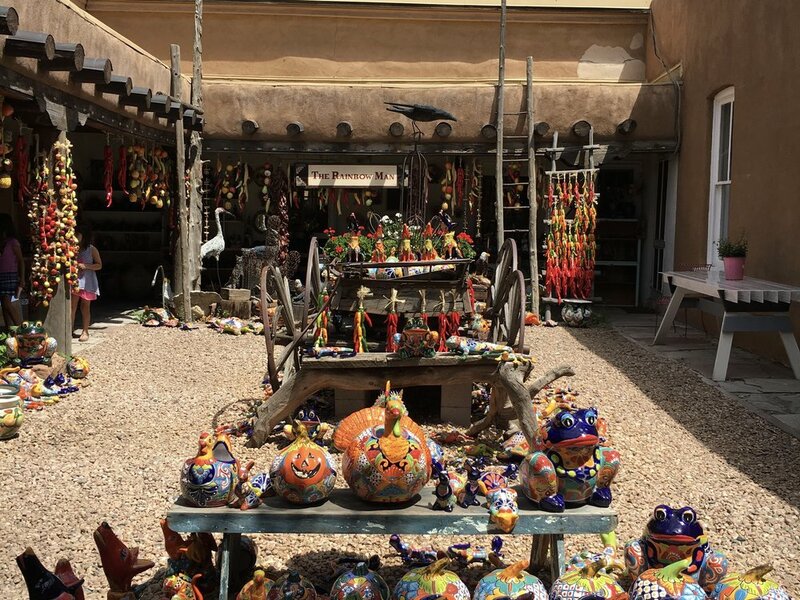 The area around Santa Fe’s historic Plaza is perhaps more well known for its retail shops and restaurants than its galleries, but it’s actually home to quite a few fabulous art spaces. You just have to poke around a bit and maybe even venture up a staircase or two to find some tucked-away venues. In the Plaza area, you’ll find lots of figurative artwork that's a bit more traditional in style, but in a good variety of media. There are some excellent galleries for painting and sculpture in the area. Other spaces specialize in art jewelry, pottery, and photography. Our Discover Downtown tour highlights the Plaza area, showcasing some of its unique and off-the-beaten-path art spaces. We also know a couple of artists who have studios in the area, so if you’re interested in arranging a studio visit, give us a shout. As you explore the Plaza, don’t forget to wander up Lincoln to Marcy, a pretty little street that’s filled with more galleries (a few of which specialize in New Mexican modernism), specialty shops like Design Warehouse and Cheesemongers, and cute eateries such as La Boca. It’s just a tiny bit off the beaten path, though, so visitors often miss it. Local tip: On the Plaza, like in the rest of downtown Santa Fe, public restrooms are hard to find. (It’s really kind of a problem.) Your best bet is the Convention Center, on the corner of Marcy Street and Grant Avenue. You have to kind of mosey through the Center to find the restrooms, but they’re nice and clean. The Convention Center is not right on the Plaza, but it’s just a short walk away, and you’ll also find ample garage parking and a Tourism Santa Fe Visitors’ Center there. The Railyard Arts District, part of the historic Railyard, is home to several galleries. Most of these are housed in sleek, warehouse style spaces evocative of the Railyard’s industrial past. And as you might guess, the work is largely contemporary and often a bit sleeker and edgier than what you might find on the Plaza and Canyon Road. The Santa Fe Railyard is also home to SITE Santa Fe, a cutting-edge space dedicated to contemporary artwork, Warehouse 21, Santa Fe Clay, the Museum of Encaustic Art, as well as the Jean Cocteau Cinema, owned by George R R Martin, and the Violet Crown Cinema, which provides a posh movie-going experience (think smaller theaters, comfier seating, a full menu, and beer and wine on tap). Finally, the Railyard is also where you’ll find the famed Santa Fe Farmers’ Market. When creating a tour of this area, we wanted to highlight both the Farmers' Market and the galleries – a seemingly tricky task, but our guide Liz designed a unique tour that seamlessly weaves together these different aspects of the Railyard experience. If you’re here on a Saturday, definitely try to catch her Farm to Canvas tour for an immersive, hands-on exploration of this arts district. Local tip: Again, restrooms are important! Look for them at the Farmers’ Market pavilion during market hours. Don’t miss the Railyard Park, and be sure to check out the events calendar to see what’s happening while you’re in town. 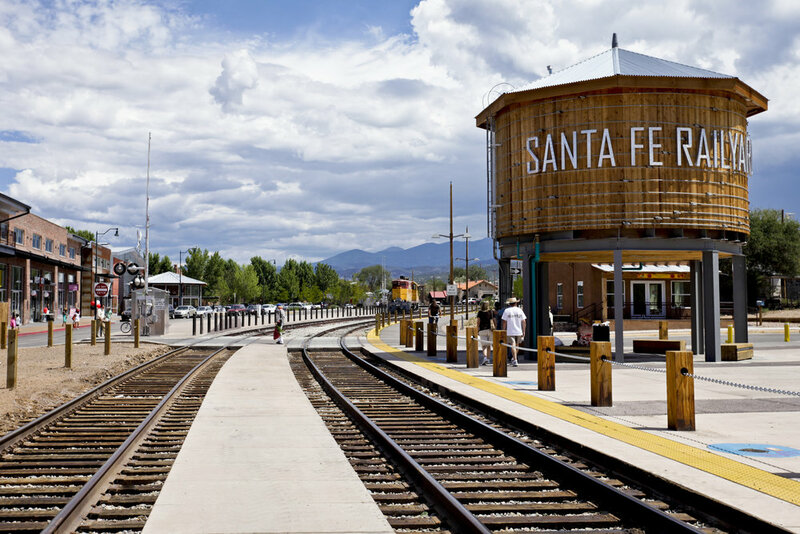 Technically an extension of the Santa Fe Railyard, the Baca street area was once a coal and fuel storage yard for the Denver & Rio Grande and New Mexico Central railways. Today part of the neighborhood retains much of that industrial feel, with airy warehouse-style structures that now house shops, restaurants, studios, and other retail spaces. Further north, Baca Street is mostly residential and lined with historic adobe homes. There aren’t as many art spaces here as there are on Canyon Road, near the Santa Fe Plaza, or even in the Railyard, but you will find a bit of everything: glass blowing at Liquid Light Glass (try to catch a demo if you go – it’s pretty mesmerizing! ), hands-on classes and workshops at Baca Street Pottery, unique vintage clothing and local artwork at Art.i.fact, and tasty eats at Counter Culture Cafe. Yet another area that was once largely industrial, the neighborhood near the intersection of Siler Road and Rufina Street has recently seen an influx of arts spaces and creative projects. Meow Wolf has everyone talking about The House of Eternal Return, an interactive art installation that feels a bit like a psychedelic funhouse. The project was backed by George R R Martin and combines arts and entertainment in a super creative way: the installation doubles as a venue for world-class musicians. Guests on tours often ask me if Meow Wolf is worth a visit. The short answer: yes. It’s definitely unique, and you could at least squeeze in a short visit. While many people spend hours exploring the installation, I always find an hour to be plenty. Talk about sensory overload! If you’re visiting with kids, they’ll definitely love it, although the experience may be a bit much for younger children. If you’re visiting with a group of adults, they’ll enjoy it, too. The Siler-Rufina district is also home to 5. Gallery, the Adobe Rose Theater, and Teatro Paraguas, along with several eateries including Duel Brewing and the Rufina Taproom. Sign up to receive our Canyon Road Cheat Sheet!